Central Canterbury Farm Forestry have a demonstration/trial area at Silverwood. 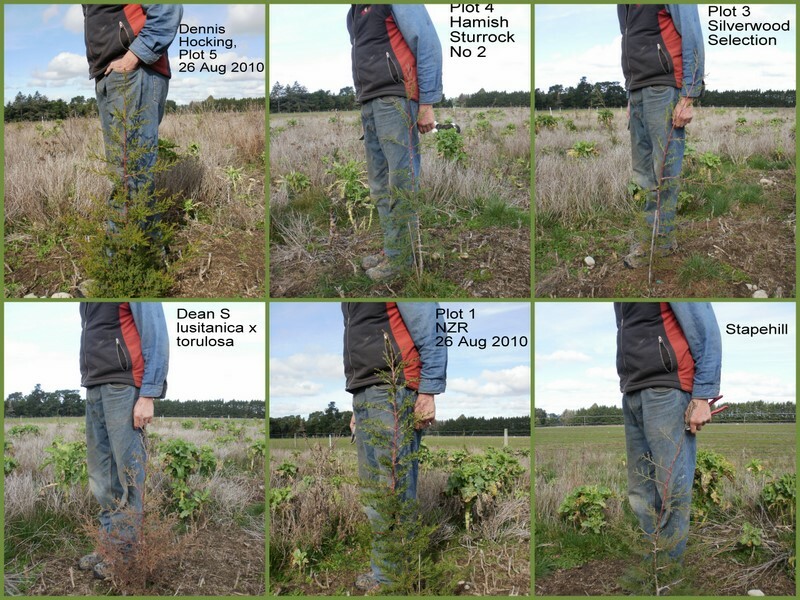 Learn more about this trial by downloading this file Silverwood Cypress trial Sep 2009. Please note- if you want a printable trial plan to take to the site- please use the download document above. Trees were about 30-40 cm high when planted on 22nd September, 2009. Lines were ripped then rolled down again with a tractor running on the rip line. Soil was moist but ‘could do with rain’ at planting. Plots are unreplicated (only one plot of each type) and so this is a demonstration kind of trial- but will yield very useful information as time goes on. One row of canker resistant Lawson Cypress C. ovensii. After that you get to the ‘trial’ proper. There is a 4 m gap from fence to a single row of Stapehill planted 4 m from last row of trial plants. 6 To be planted in Dean Satchell / P. Milne selection of macrocarpa. Perhaps keep a similar sized area free for the same group of 5 cultivars to be planted here next year? Each plot has 5 x 5 = 25 trees – 3 m between rows and 3 m between plants. There is an extra 1 m between plots- instead of 3 m between trees, there is a gap of 4 m.
In time we will add photos to this page. August 2010- Plots looked great. A second quick form prune was done on a few trees – all plots required a little management. Plot 5 was looking particularly good/straight. May 2011 – a few – approximately 40 branches pruned from trees across all plots – minor form pruning. September 2011 a few more form pruning cuts made to remove ‘ugly’ branches competing with main leader. 7 Sep 2011 – Plot 5 – very vigorous side branches – each tree in plot 5 pruned to approximately 10 cm from ground level. Up to 10 branches/tree greater than 5 mm diameter. Tony Tripp has photos. There were often 2-3 branches in first 10 cm of trunk that were greater than 20 mm diameter. Native area – spread approximately 30 large bales of straw around natives and ready for further natives to be planted at end of Sep/early Oct.
14 rows were ripped in early Sep towards Hororata from the main cypress trial area – Doug King.